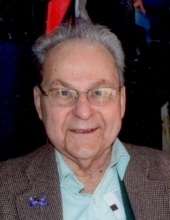 Robert Joseph Doucette, known to most as Bob, age 99, of Stratford, passed away peacefully on January 29, 2019 at Bridgeport Hospital. He was born in Lynn, MA to John and Kathleen Doucette, and has resided in Stratford since 1951. During World War II, he served his country honorably in the United States Army Air Forces as a bombardier, earning the rank of Second Lieutenant. His plane was shot down over occupied France on November 5, 1944, and he was captured by the Germans, serving six months as a POW until liberated. When granted leave he returned to Lynn to marry the love of his life, Jeanne Robichaud, on March 4, 1944. They enjoyed 63 years of marriage until her passing in 2007. As a couple, they were known not only for their love and devotion but for their exceptional talent on the dance floor, which was fitting as they had met at a dance. Bob worked for Sikorsky Aircraft for 33 years as a mechanical engineer until his retirement in February 1987. In addition to dance, he cherished spending time with family, old movies, going on cruises, playing golf, watching baseball, Lawrence Welk reruns and Heineken. He was active in the parish at Our Lady of Grace Church where he served as a lector for many years. Bob is survived by his four children: Robert Doucette, Jr, and wife Kristina of Manchester, NH; Jean Squashic and husband Kenneth of Naugatuck, CT; Mary Zsiga and husband Stephen of Beacon Falls, CT; and John Doucette, PhD, of New York, NY. He is also survived by his nephew Robert Doucette of Homosassa, FL, as well as four grandchildren Lisa, Joseph, Stephen and Ryan, three great-grandchildren Kaylyn, Alex and Brayden and several great-nieces. He was predeceased by his brother George and his nephew George Jr.
Friends are invited to attend a Funeral Mass of Christian Burial on Saturday February 2, 2019 at 10:30 a.m. by meeting directly at Our Lady of Grace Church, 497 Second Hill Lane, Stratford. Interment with military honors will follow at Gates of Heaven Cemetery at 1056 Daniels Farm Rd, Trumbull. Relatives and friends may greet the family on Friday, February 1, 2019 from 4:00 p.m. to 7:00 p.m. in the William R. McDonald Funeral Home, 2591 Main Street, Stratford. For further details or to leave condolences, please visit www.wrmcdonaldfuneralhome.com. To send flowers or a remembrance gift to the family of Robert Joseph Doucette, please visit our Tribute Store. "Email Address" would like to share the life celebration of Robert Joseph Doucette. Click on the "link" to go to share a favorite memory or leave a condolence message for the family.